SANTA BARBARA — Santa Barbara Yacht Club hosted 29 sailboats and more than 100 on-the-water spectators Sept. 9 for the eighth annual Yachts of Love Charity Regatta, benefiting Serenity House, and Santa Barbara Visiting Nurses and Hospice Care. Sailboats had “celebrity” crews and skippers on board in the form of 40 sailors and officers from the visiting USS Halsey anchored just offshore, along with Santa Barbara County Sheriff Bill Brown and Fire Chief David Sadecki. Hundreds of club members and guests watched the race from the clubhouse deck. By day’s end, the fundraiser had generated a whopping $130,000 to assist Serenity House and Santa Barbara Visiting Nurses and Hospice Care. Longtime Santa Barbara YC member and this year’s event chairman, Tom Parker, raced in the regatta with USS Halsey Commander Mike Weeldreyer and other Navy personnel aboard his 69-foot maxi sled Taxi Dancer. Having volunteered in the past in support of this regatta, Parker said he felt it was his turn to take the helm for this year’s event. And give back they all did. 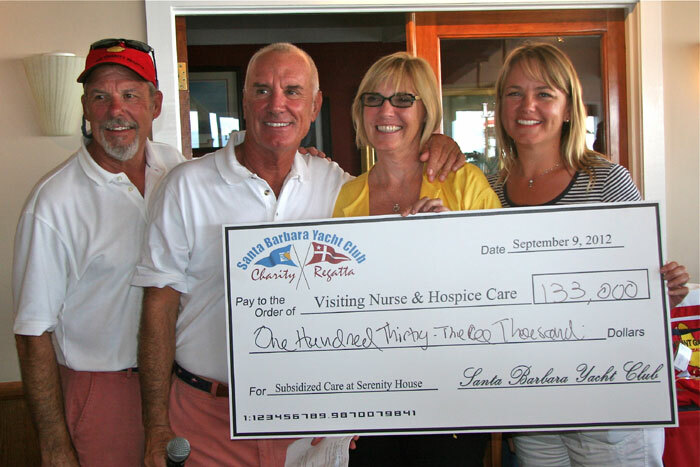 To date, Santa Barbara YC has raised a total of $800,000 in support of Serenity House, and Santa Barbara Visiting Nurses and Hospice Care, during the regatta’s eight-year history. In addition to the fundraising effort and camaraderie the annual charity race brings to the club and the sailing community, a key part of each year’s event is recognizing individuals who go “above and beyond” through their volunteering efforts, helping people in need. This year, Julie Kaufman was honored during the festivities for her contribution of 336 hours of volunteer work in support of Santa Barbara Visiting Nurses and Hospice Care, and Serenity House. “The best moment of the day, for me, was honoring volunteer Julie Kaufman for her selfless work on behalf of our community,” Parker said. With 80-degree weather, a good breeze and calm seas, two fleets of boats sailed the 5-mile course — all of them with Navy personnel on board. In PHRF Fleet A, finishing first out of a fleet of 10 was Blues Crews — a J/29 co-owned and sailed by Steve Williams, Jeff Robinson and Dave Baxter — finished first in PHRF Fleet A. Dirk Freeland’s Farr 40 Skian Dhu took second place, and Mark Nobel finished third aboard his J/105 Escapade. Nineteen boats entered the H Fleet Pursuit Start Race, with Liberty, a Schumacher 30 with Steve Kennealy aboard, earning first place. Lander Nicolait’s Hunter 375 Second Wind took second, and Psyche’s Song, a Freedom 38 with team Wann and Judy Rawles, took third place. For more information on the race, visit sbyc.org.